For more information on sponsorships click here. A special thanks to the American Quarter Horse Association for their continued support and recognition of RMQHA throughout the years. RMQHA members receive 10% off at Greeley Hat Works! Present your membership card at check out. 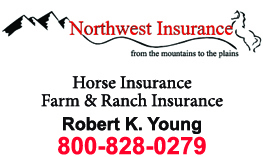 Northwest Insurance, LLC is owned by Robert K. Young of Purcell, Oklahoma and provides horse insurance and farm & ranch insurance. Please visit their website at www.northwestequineinsurance.com.